Harvey Houses of New Mexico: Historic Hospitality from Ratón to Deming (The History Press) vibrates with memories, voices, and historical details, evoking the pivotal era when visionary Fred Harvey imbued Western train travel with outstanding cuisine, Native culture, and world-class hospitality. Rosa Walston Latimer pays devoted attention to the vibrant inner lives and daily work life of Harvey Girls, transforming what could have been a prim volume into an intimate page-turner. She also rousingly lauds as a women’s-rights game changer Fred Harvey’s decision to give up to 100,000 young unmarried women respectable jobs. This book lets readers of our features “In Harvey Heaven” (mynm.us/harveyheaven), by Stephen Fried, and “Vegas Revival” (mynm.us/vegasrevival), by Kate Nelson, ride their fascination to the end of the line. Jerry West: The Alchemy of Memory (Museum of New Mexico Press), along with being a portable retrospective of the New Mexico artist’s work, also represents the next phase of art’s evolution after Baumann’s era. NM Museum of Art curator Joseph Traugott writes in the foreword, “Touristic genre scenes associated with the Taos and Santa Fe art fraternities gave way to abstraction, nonobjectivity, and minimalism. West’s modernist images challenged local audiences.” His paintings often mash the beauty of the state’s landscapes right up against grotesque and eerie elements—but along with discombobulation, the book also provides insights. Many of the color plates are accompanied by plainspoken commentary by West that explains his artistic choices. 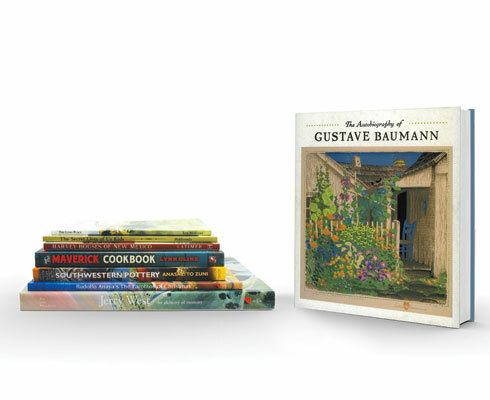 The Maverick Cookbook: Iconic Recipes and Tales from New Mexico (Leaf Storm Press) spends a chapter with Baumann; others focus on Georgia O’Keeffe, Billy the Kid, and even Dennis Hopper. The story-studded cookbook pairs engrossing stories of mythic New Mexicans with recipes they are associated with. One fun sentence: “[Witter Bynner] often entertains his guests by playing a piano rolled up the street from La Fonda.” Feast on plenty of those kinds of tidbits, along with recipes for albóndigas, green chile lamb stew, and empanaditas. Two more poetry sources include Santa Rosa native Luis Montaño’s The Long Place (Ocote Press) and Silver City and Grant County poet laureate Bonnie Buckley Maldonado’s The Secret Lives of Us Kids (Farcountry Press). Montaño is a bard of the sere, small towns of this state, like Vaughn: “This requires one leafless tree, / a trainyard, the llano / and an odd year like 1943.” Maldonado’s childhood memoirs of growing up in Montana are recorded in short, spare stanzas infused with the warmth she feels for her scrappy family. Pottery is everywhere in New Mexico, but if one doesn’t know how to interpret its shapes and motifs, a lot is going unseen. In Southwestern Pottery: Anasazi to Zuni (Taylor Trade), the peppy prose of Allan Hayes and John Blom zips readers along through the history and evolution of pottery in various New Mexican pueblos (with a handful of chapters on other states’ traditions), accompanied by a wealth of crisp, colorful images. Slow down! Pull over! What happened here? 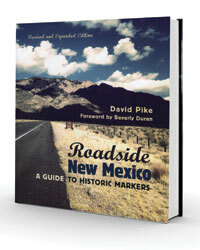 To answer that question, New Mexico Magazine contributor David Pike has put together a new and improved edition of his 2004 book. Anyone interested in the Land of Enchantment will munch through his collection of short historical essays like so much chips and salsa. If you’ve rolled down any of our roads, you know the sturdy retablo-shaped brown signs spaced at coffee-break intervals along the shoulder. The focused, tightly worded Official Scenic Historic Markers delve into an amazing breadth of subjects but might leave you longing for more. Springing off each official marker, Pike adds depth and detail in readable, just-right-sized essays. The subjects range across momentous events that shaped our state’s history, snippets of everyday life, biographies of notable and obscure New Mexicans, and “Oh, wow!” natural features. A few enhancements pump up this revised edition, the largest being 65 new markers dedicated to important women. The book drills deep in surprising ways. For instance, one of the new Historic Women Markers, nicely expanded upon by Pike’s text, tells the story of Cathay Williams, an African American and former slave who became the first documented woman to serve in the U.S. Army, in the 19th century—as a Buffalo Soldier in the Apache Wars, and disguised the whole time. Hollywood couldn’t make this up. Whether you’re an imminent visitor planning your first trip to New Mexico, a veteran traveler hoping to light out for new territory, or a native who always wanted to know the story behind Dog Canyon’s name, Roadside New Mexico will deepen your appreciation of this enchanted state.